Looking at the jquery fileupload plugin I noticed there wasn't a decent example of how to get it working in a asp.net webforms application. So I decided to share my little simple sample project with you. The ashx handler is very basic and you should probably expand it. I found some nice resources here but the project was not included for download. Basically I wrap my JsonResult in a generic wrapper JSonResult<T> (included with Weld) so that Weld knows what type to expect. Next I add the AjaxMethod Weld attribute. Client side I use TypeScript and use the generated proxy class. If I add or remove properties from my Person class my changes will cascade to the clientside immediately. In this post I want to talk about a little tool called Weld I wrote to make integrating client-side TypeScript and server side MVC C# easy. Imagine you have a server-side method that calculates some value you want to use client side. In this sample project I want to calculate the sum of two values I have in input fields. Server-side I have this action-method in my home controller. Now to access this method client I just need to add a Weld attribute. For this I first install Weld using NuGet. Just “Install-Package Weld” in your NuGet package manager console. This will install Weld as well a TypeScript.Compile and JQuery typings into your project. TypeScript.Compile auto compiles all your typescript files post-build. This enables you to detect any problems caused by server side changes. For this sample I add the AjaxMethod (Weld.Attributes.AjaxMethod) attribute to the ‘Sum’ action. Compile the project. Weld now has generated a proxy class for my home controller. I just need to include it and used it in the project. It is located in the /Scripts/Weld folder. This is fine and works OK but sometimes you want something more..’fancy’. 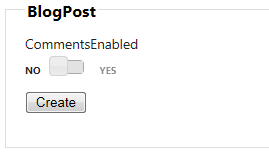 ASP.NET MVC ships with Jquery.UI so why no use the slider of JQuery.UI to create a nice toggle switch? 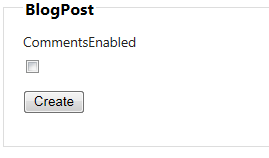 In this post I will use and modify a JQuery.UI plugin that will result in the following. The plugin is based on http://taitems.github.io/UX-Lab/ToggleSwitch/ which had some errors in my opinion. This is all what we need to get our JQuery plugin going. The change event was just passing the change event of the slider. This meant even if the boolean property did not change (you moved the slider a little) you would still get a change event. In this version the change event is only fired when the value really changed. The plugin did not allow chaining. The normal ‘change’ event of JQuery was no longer fired. This is fixed by not having a change event on the control itself but just fire the existing change event. I attached a sample MVC application as well as the JQuery.UI.ToggleSwitch plugin.